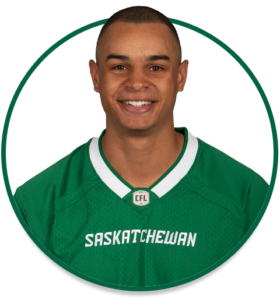 PRO: Acquired by the Riders in June, 2017…selected by the Montreal Alouettes in the 6th round (48th overall) of the 2017 CFL Draft. 2018: Played one regular-season game, registering one special-teams tackle…suffered a season ending shoulder injury. COLLEGE: Spent two seasons at the University of Calgary (2015-16)…played 18 collegiate games while with the Dinos…spent the 2016 season as a defensive back recording 11 tackles…in 2015, registered 18 receptions for 329 and one touchdown.